The feminist musician Niamh Conolly comes on the television denouncing the Catholic Church and all it stands for. She then sings an anti-clerical song. Ted and Dougal loudly dismiss the whole thing. Ted is asked to be a judge in the Lovely Girls Competition. He takes along Jack who, due to his scruffy appearance, gets mistaken for Bob Geldof. After an altercation with Jack, Ted receives a punch to the stomach and has to start the contest with some heavy breathing. The contest involves the girls doing various tasks, including, walking, laughing and sandwich making. Imelda proves to be the ultimate winner, and her prize is a meal with Ted at a Thai restaurant, paid out of her own pocket. When Ted returns to the parochial house, he finds that Dougal has somehow signed it over to the visiting popstar Niamh Conolly. With Niamh having two bodyguards in tow, Ted and Dougal have to spend the night outside in a tent. Ted tries to impress Niamh by buying her whole discography. He gets Niamh to sign them for him, but then a totally exhausted Mrs Doyle walks in saying that she has finished with the pipes and will now get on with the rest of her chores. Disgusted with the priests, the next scene shows Mrs Doyle, Niamh and Imelda dining in the Thai restaurant. Niamh tells Mrs Doyle that the parochial house has been returned to the priests on condition that she gets one night off every week. Niamh Conolly: The church in Ireland secretly had lots of potatoes during the famine, and they hid the potatoes in pillows and sold them abroad in potato fairs. And the Pope closed down a lot of the factories that were makin' the potatoes and turned them into prisons for children. 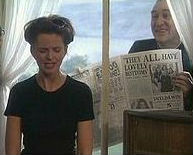 Father Ted: God almighty, she says that as if there's something sinister about it all! I mean, what is the problem with her?! Lovely Girl 1995 was stripped of the title after appearing in the rather rude film Stallion Farm. The lads at the Lovely Girls Competition are unsure if Jack really is Bob Geldof but become convinced when he tells them to Feck Off!! The closing scene shows Ted and Dougal in a burning kitchen, frantically trying to make a cup of tea without Mrs Doyle. 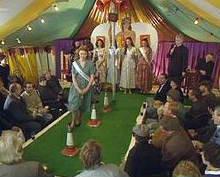 The Lovely Girls competition is a parody of The Rose of Tralee competition, which takes place in Tralee, County Kerry. Niamh Connelly is a parody of singer Sinead O'Connor, who also criticised the Catholic Church.